After a very rough Winter, New England was treated to a beautiful and relatively comfortable Summer. We had a few 90º+ days, but even those were kind of enjoyable after being buried in three feet of snow in February and March. 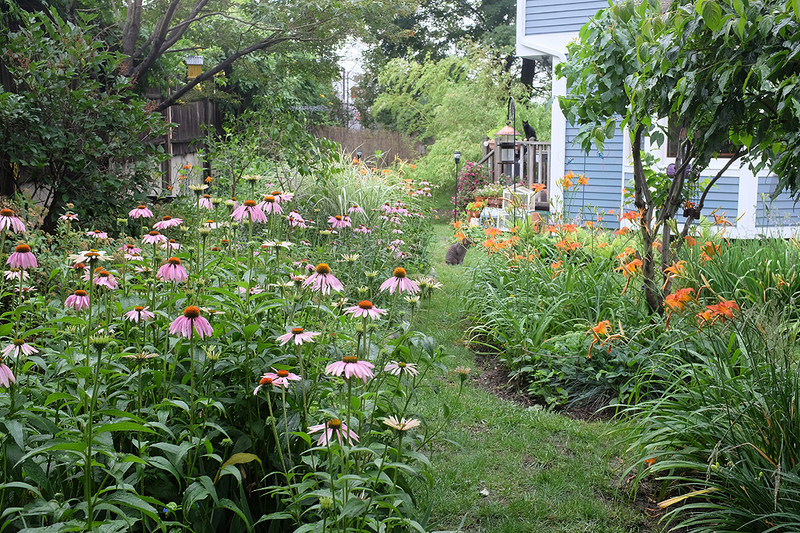 The RainyDayGarden did not suffer any ill effects from the thick Winter carpet as most of the perennials, while a little late, all came back by the start of June. Here is a summary of what happened in the RainyDayGarden this Summer. Note the new table and chairs we “inherited” from some friends (thanks Bill and Irfan). 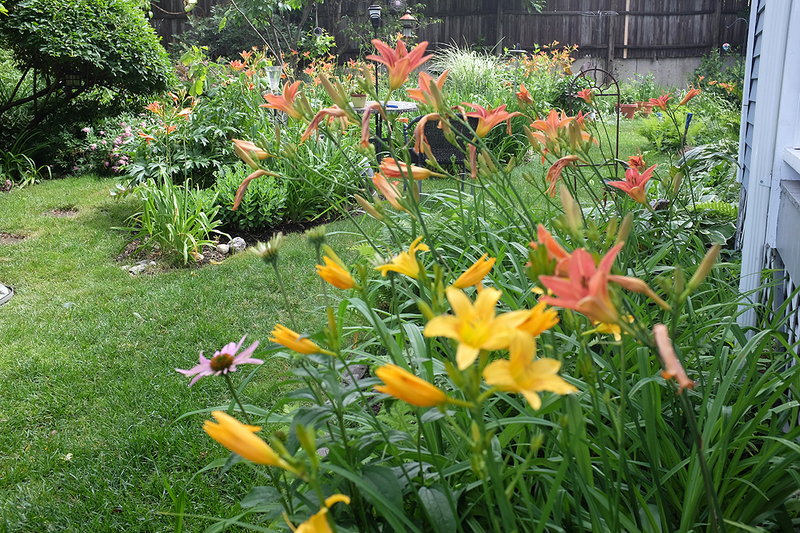 The day lilies have started to bloom in earnest, and the purple cone flowers not far behind. All the recent rain has been great for the garden. 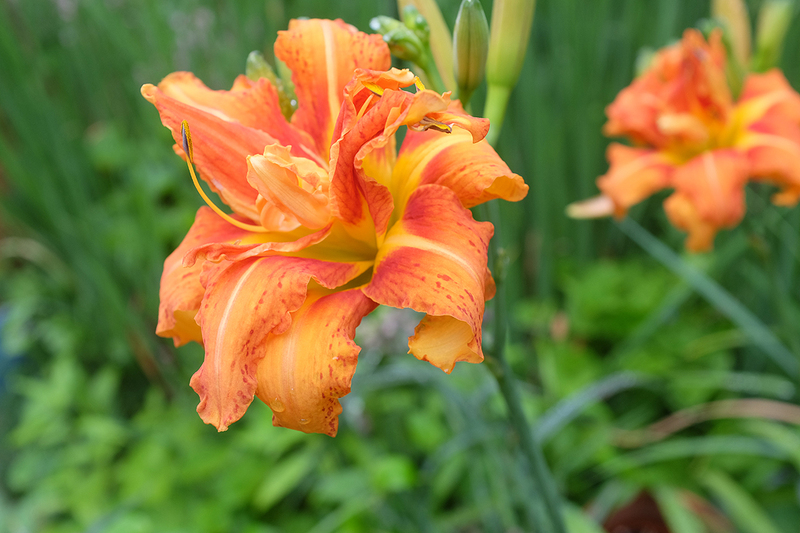 We are happy to report that the RainyDayLily hybrid (Thank you Melani for the name!) is apparently stable and has returned for the second year. The hybrid is a combination of the large yellow variety and the daintier orange version. 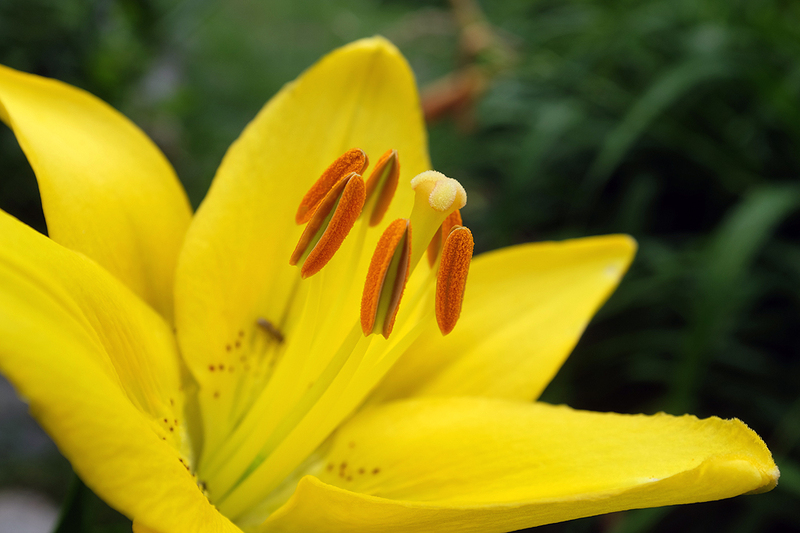 The flower is yellow, smaller than either parent, with hints of orange in the center. Right in front of the office are three huge cottonwood trees. In them are all manner of nests (squirrels, finches, etc). We could hear the baby Orioles chirping through the front windows. 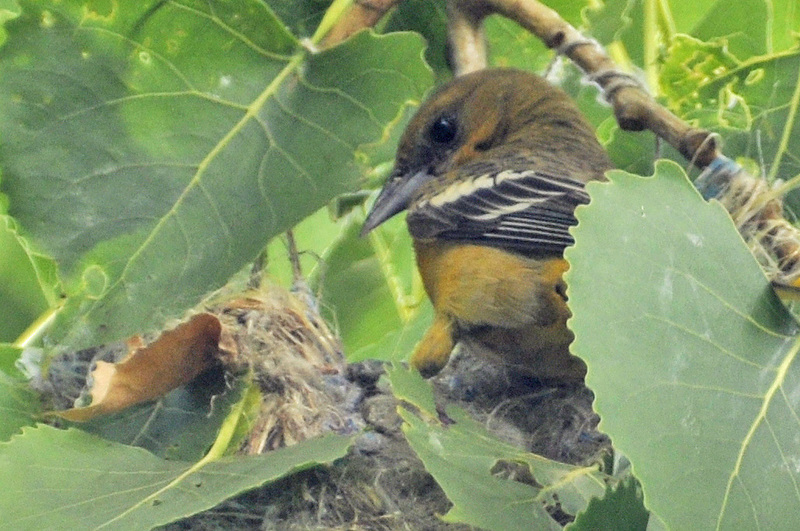 Every time we headed out the front Mama Oriole would issue her “alarm” call and the baby Orioles would fall silent. We finally managed to track down the source of the cries and it was right above the end of the front walkway. We got some shots of the Orioles on their feeding runs. The chicks are still too small to appear over the edge of the nest, but it won’t be long before we’ll have a shot of them !!! There was a major ruckus in front this morning. 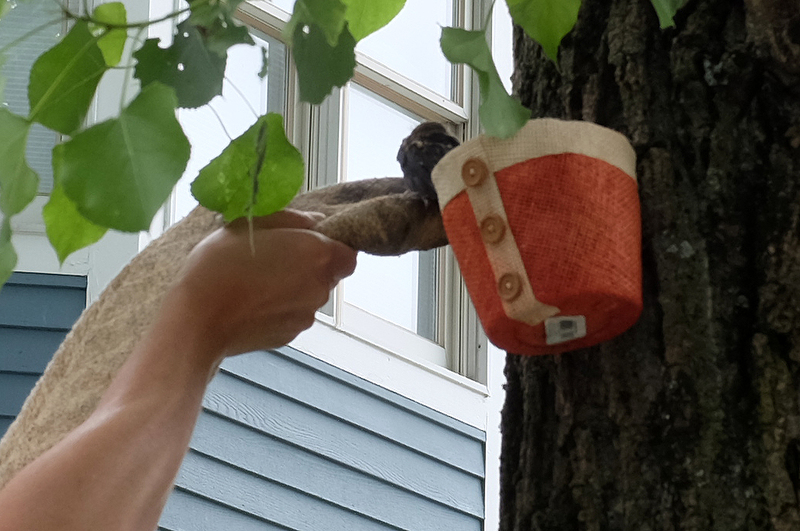 We went out to see what was up and found that one of the oriole fledglings had gotten out of the nest and was just hopping about. Not wanting it to end up as a cat toy, the interns did some research online and found that we could make a temporary nest for it until it got big enough to fly on its own. So we spent the morning doing that. OK..a yellow jacket nest under the Vespa cover. We are not as warm and fuzzy about them as we are about the fledgling. Still, we didn’t want to mess up their nest just because they built it in an inconvenient place for us, so we moved them instead of killing them. 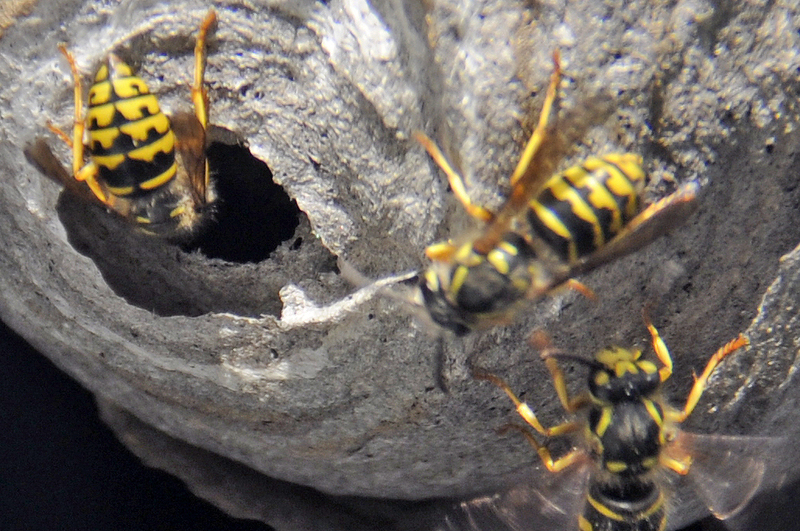 Of course, we couldn’t resist getting some shots of the yellow jackets—angry angry yellow jackets—coming out of the hive. While doing a check on the garden we noticed something we had not seen in a long time. One of the true lilies had managed to survive long enough to bloom! We had forgotten we had them, as the #@^*# Japanese Lily Beetles usually eat them right down to the stems long before now. Apparently a super snowy winter is not “friendly” to the Japanese Lily Beetles. Nice!!! Also happy to see the Mason bees out and about doing their thing. 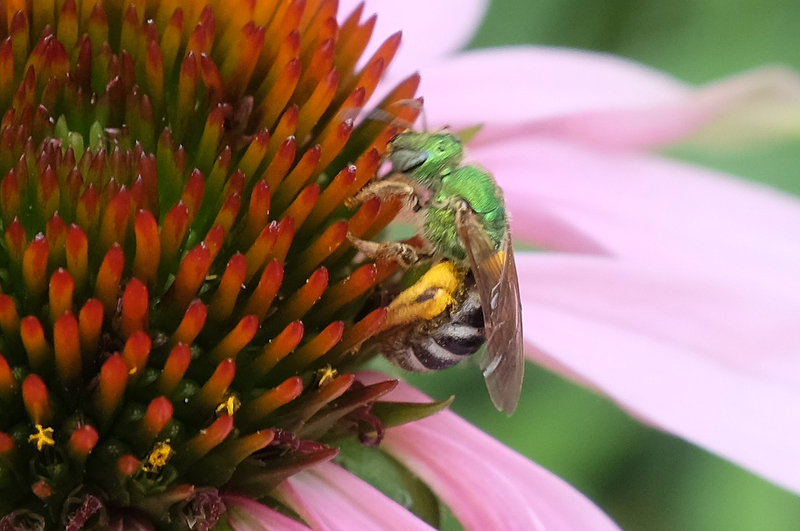 Mason bee fun fact…they are 10x better pollinators than honey bees (and they are green). 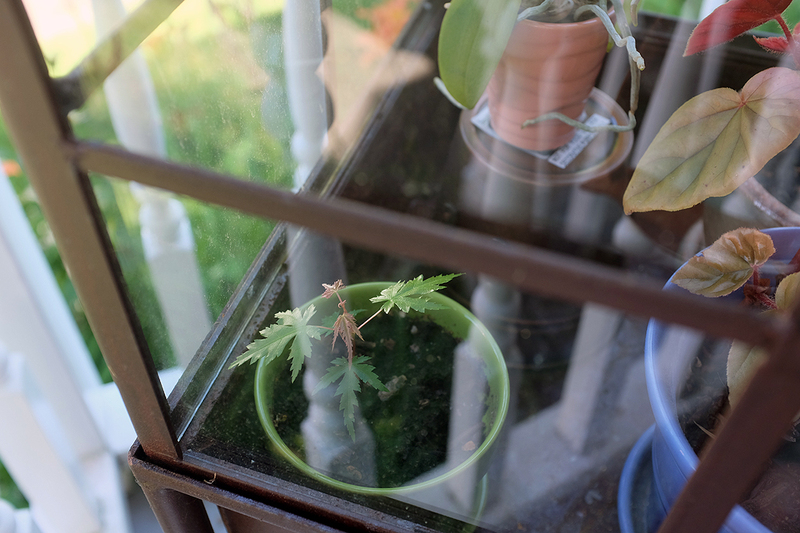 The Japanese Maple seedling we found back in April has formed its third set of leaves. We are hoping its growth will start to accelerate now that it has more solar-absorbing capacity. 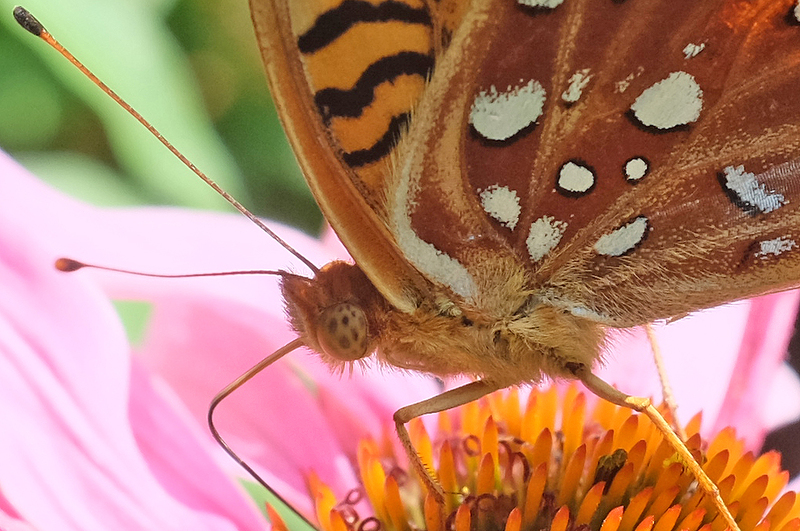 A Great Spangled Fritillary butterfly (we didn’t know what it was, had to look it up) stopped by the RainyDayGarden this month. 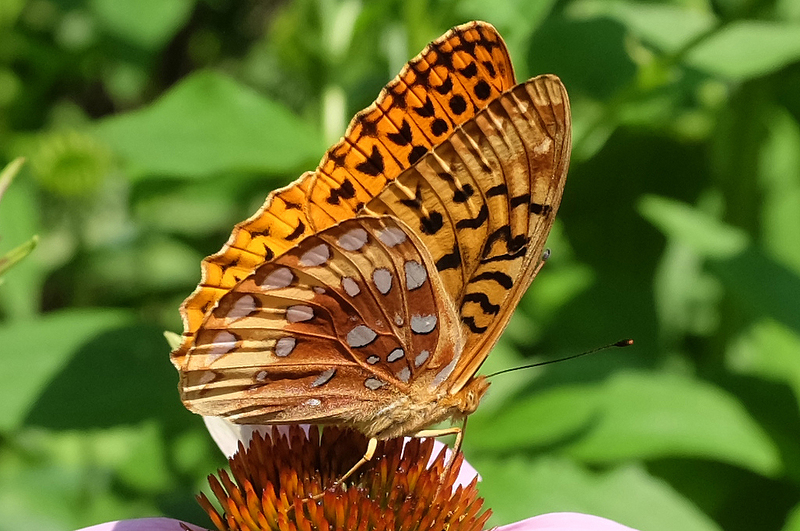 It was visiting a few of the purple cone flowers that had just bloomed. It is about the size of a Monarch, a very quick flyer, but did stop long enough for us to get some pretty decent close up shots. July is typically when the hostas bloom. As we don’t water them unless absolutely necessary, they can look kind of ragged if the weather is hot and dry. Not this year! 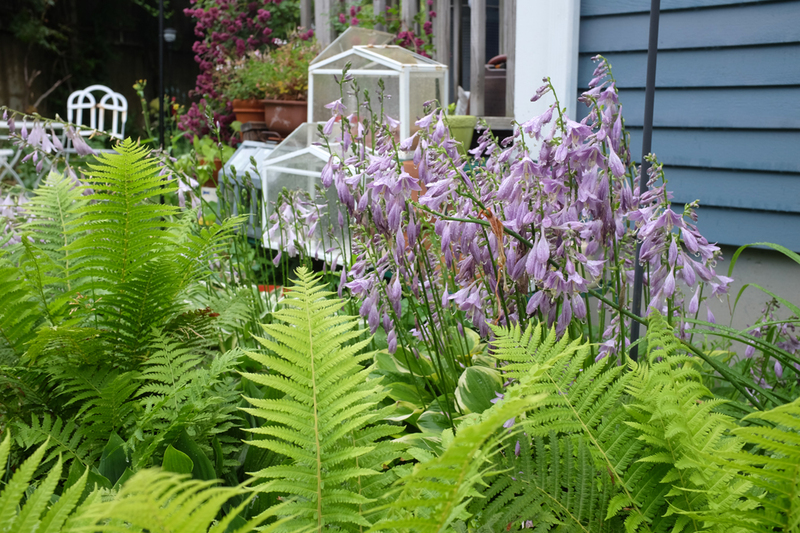 Both the hostas and the ferns were loving this cool and wet July. The last pic is actually not of a hosta bloom, but a wildflower called Creeping Bellflower. 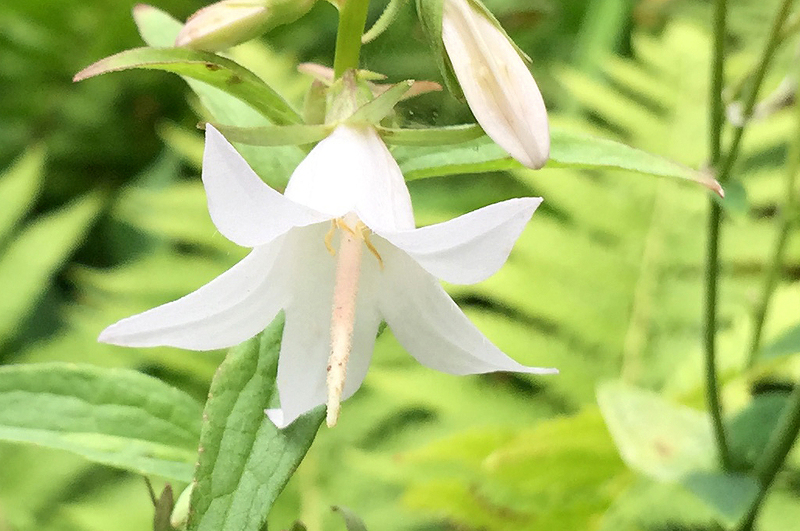 They are considered weeds, but we only pull them if they pop up someplace “inconvenient.” The fairy tale Rapunzel uses Creeping Bellflower (Campanula Rapunculoides) as the instigator for the story. They are hardy, no care from us, and the pollinators seem to like them. While it may sound like the RainyDayInterns don’t do any work in maintaining the RainyDayGarden, they do weed it periodically. However, they will leave many of those which do flower. Some of them have very nice blooms, none of them require any care, and the butterflies and bees seem to like them just fine. Some might think that kind of defeats the purpose of weeding, but they do it more to control where they appear, not to get rid of them. The blue flower is a Day Flower (Commelina diffusa). We learned that the young shoots and tips of Commelina species good steamed, as a pot herb or fried. Have not tried it:-) The weed with the yellow flower is a Groundsel. It turns into a puff which looks a lot like a dandelion. Apparently it acts as a host for the fungus that causes black root rot in some vegetables and ornamental flowering plants, but at least the flower is nice. 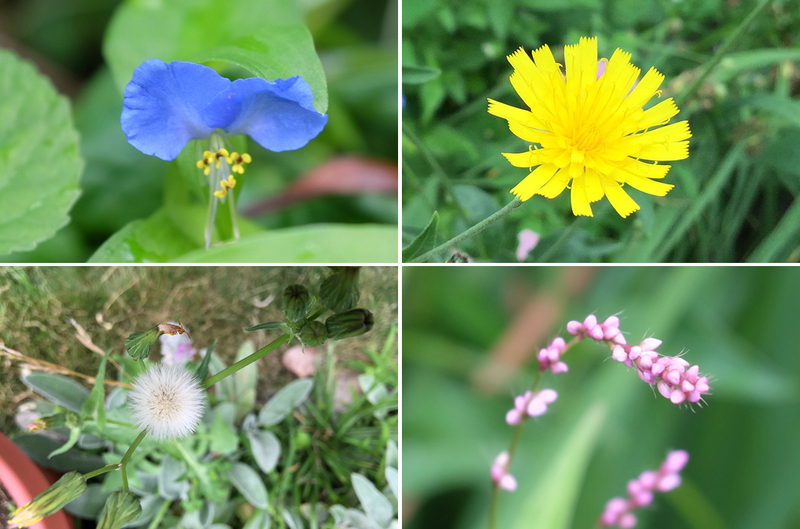 The pink one is a Long Bristled Smartweed….and apparently it is banned in Connecticut, whatever that means. House plants sometimes can benefit from a little time outside…especially if they don’t get enough light inside. 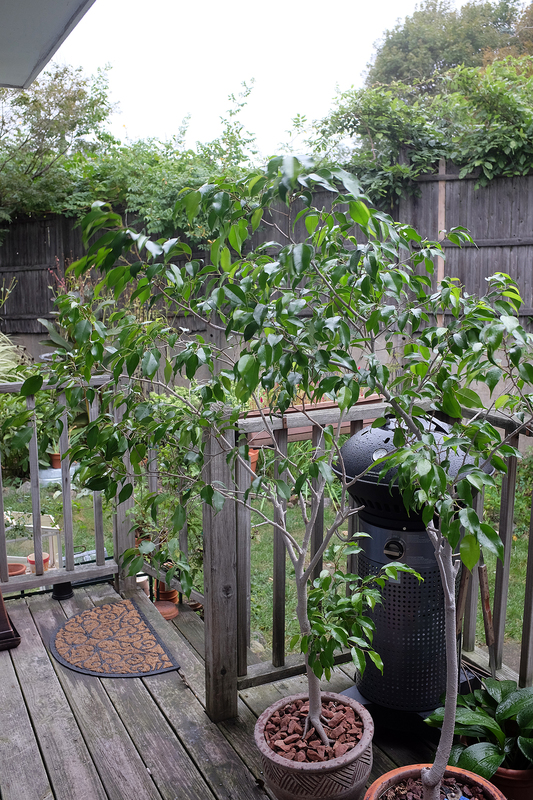 This was the case for the two ficus plants we’ve had for fifteen years. They hung onto life inside the office, but have never really thrived. Last year, we experimented with one of the plants by putting it outside in May and taking it back inside in October. We repeated that this year with both plants and the results were pretty dramatic! So if you have a house plant that you just can’t get “going,” try putting it out IN THE SHADE next Spring and see if some diffuse bright light will get it into gear.